Son of Joseph Hall Fyvie and of Jean Fyvie (nee Clark); husband of Charlotte May Fyvie, of Epsom, Auckland City, New Zealand. The following details were sent to me by Mr Kenneth Weston who now owns Fyvie's medals. Ken travels to Chippenham each ANZAC Day to leave a cross on Fyvie's grave. Joseph Fyvie was born on 12 July 1916 in Glasgow, Scotland and came to New Zealand with his parents at the age of 10. He received his secondary education at Mount Albert Grammar School, Auckland where he passed the New Zealand University entrance examination and at night school, he studied for the New Zealand Society of Accountants. Sports in which he was actively involved included football, cricket, tennis and golf, being a member of a number of associated clubs. 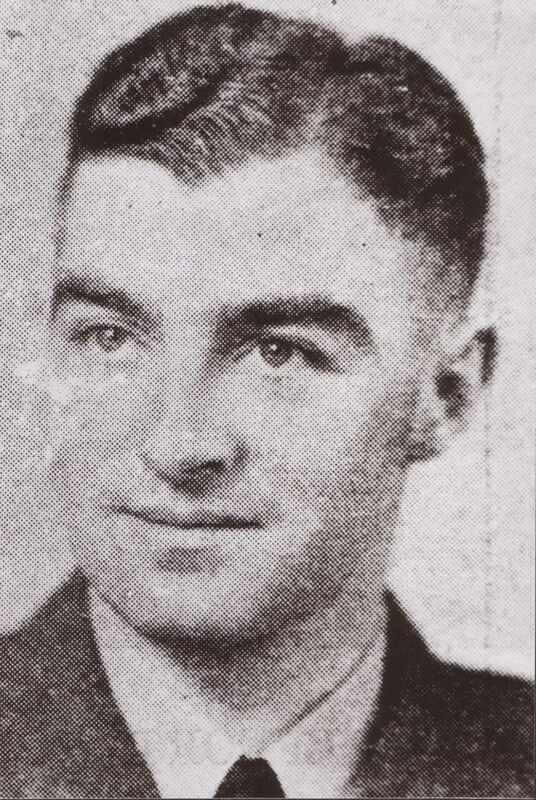 He applied to join the Royal New Zealand Air force on 21 September 1939 and was enlisted on 29 September 1940 with the rank of Aircraftsman Second class. At the time of this application he was employed as a clerk with R & W Hellaby Livestock in Auckland. After completing ground training at Levin on 26 October 1940, he was promoted to Leading Aircraftsman and commenced pilot training at 2 EFTS. On 20 December he commenced advanced pilot training at 3 FTS at Ohakea until 22 March 1942, when he was promoted to Sergeant. He was awarded his flying badge on 10 February. He married Charlotte May Doel on 26 March 1941 at St David’s church, Auckland. She was a work colleague at Hellaby. Charlotte May Doel was the sister of NZ39907 Flt Lt Alfred William Doel who was posted missing in action on 12 June 1943 flying his 38th mission as a captain of a Lancaster, DV157, coded Z with 12 Squadron flying out of Wickenby, Lincs. Fyvie embarked on the "Awatea" for Canada on 29 April 1941, disembarking in Vancouver on 14 May. He then travelled by train to No 1 "M" Depot at Derbert where he arrived on 20 May and then embarked for England. He arrived at No 3 Personnel Reception Centre, Bournemouth on 29 June. On the 23 July, he was posted to 9 SFTS at RAF Hullavington. There he continued his training on Miles Magister advanced trainers. "Was practising ZZ approaches with Fg Off Scragg, RAFO (Reserve of Air Force Officers) as safety pilot - and in reasonable weather - when the aircraft was seen at about 1500 feet in the beginning of a spin. Control appears to have been regained at about 500 feet but the aircraft was then in a vertical dive from which it did not recover." The aircraft crashed in the middle of a field at Priory Farm, Kington St Michael, Chippenham, around mid afternoon. A local farmer and his son were attracted by the loud noise, went quickly to investigate and found the damaged aircraft with the two crew still inside. Even though the aircraft did not catch fire or break up there was nothing to be done for the occupants. "The accident was due to collision with the ground following an involuntary spin from which partial control was regained too late. That the cause of the accident was controversial, but possibly due to an error of judgement when changing from hooded to visual flight." An inquest held on 22 September determined that Fyvie’s death was caused a a result of "fracture of the skull and other injuries sustained when the aircraft in which he was flying crashed from causes unknown." 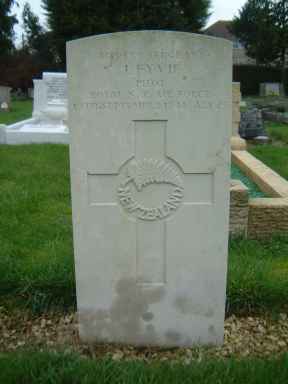 He was buried in Chippenham cemetery on 23 September. Fg Off Martin Francis Scragg was buried in his home town of Bedford. He is buried under a family headstone on which his brother Flt Sgt Alban Frederick Scragg is also commemorated. Flt Sgt Scragg was reported missing in action on 30 November 1940 with the crew of a Whitley MkV T4219 (YG-P) of 502 squadron when on an anti submarine patrol. Joseph Fyvie was entitled to the War Medal and the New Zealand War Service Medal. These were posted to his widow at her home address in Epsom, Auckland in 1950. Charlotte May Fyvie never remarried and lived in the same address until shortly before her death on 19 September 2004. Her ashes were interred in the Doel family grave in Purewa cemetery, Auckland.